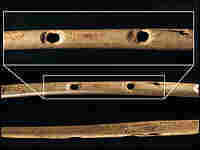 A Little Flute Music To Warm The Cave Archaeologists have unearthed the world's oldest musical instruments: flutes. These vulture-bone flutes no doubt helped warm our ancestors' spirits as they pushed north into Europe's hostile Ice Age conditions. 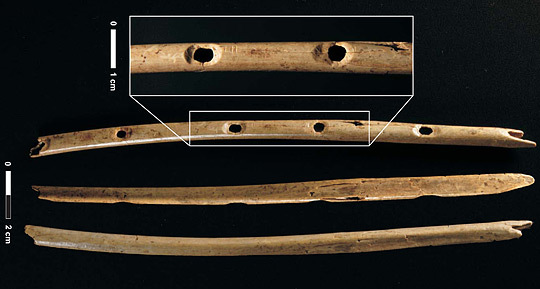 Bone flute from Hohle Fels with an enlarged image of the finger holes. 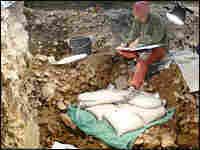 Archaeologists dig for new finds in a cave in southwestern Germany. Archaeologists say they have unearthed the world's oldest musical instruments. They are flutes, made of vulture bone and mammoth tusks. They were found in caves in southwestern Germany and date back to the time when modern human beings — who actually looked like us — were first venturing into Europe. Scientists have little doubt that music is so basic to human nature that it goes back to our earliest days as a species. It's hard not to make music, when you think about it. "Clap your hands, tap your foot, dance, sing, whistle. There's endless music you can make just with your body," says Nicholas Conard at Tuebingen University. 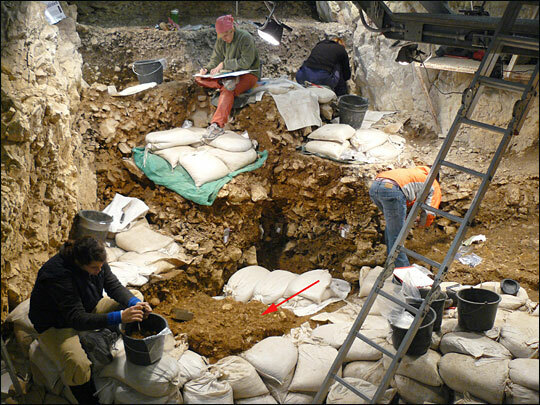 Since Conard is an archaeologist, he has been looking for hard evidence of early music. He and his colleagues now report in the journal Nature a spectacular discovery: four flutes, buried in Ice Age garbage heaps in the caves of Germany. They date back 35,000 to 40,000 years, making them the oldest undisputed musical instruments. One of the flutes is made of a vulture wing bone and is about a foot long. The other flutes were made out of mammoth tusks. The early musicians clearly had leisure time not only to play, but to make instruments. "That's really quite a surprise that flutes would be made out of massive mammoth ivory, which is material that's very hard to work, and not just bird bones, which are hollow and ideal for making flutes," Conard says. He suspects the ivory flutes were favored because they produced a deeper, richer tone. He says archaeologists have found similar ivory flutes in more recent cave deposits in the same region. They've figured out what it took to make them. First, a tube of ivory needs to be whittled from the larger tusk and then split in half. "Then you have to hollow it out, get the exact form, smooth out the inside and outside, cut the ends to length, and cut the finger holes. And even if you can do all that, then you've got the problem — how do you get the halves together?" Conard says. The ancient craftsmen cut delicate notches in order to get the halves to fit just so. Then they used some type of sealant or glue. "And then — you can play it," Conard says. In order to figure out what those ancient flutes actually sounded like, a colleague of Conard's made a replica out of vulture bone. "The first recording I heard was an absolutely horrendous version of The Star-Spangled Banner, which sounded something like a more awful version of Jimi Hendrix at Woodstock," Conard said. Alas, he wouldn't share that recording with NPR, "because I don't want to mix serious science with jokes. But I must say I just cried when I heard it, I was laughing so hard." Now, this ancient flute was found very close to another famous artifact Conard recently unearthed from these caves: a carved figure of a female with exaggerated sexual characteristics — a Venus figurine. "It's certainly plausible that the people who carved and used the flute, also carved and used the Venus figurine. Again, we can't say for sure, but they could easily go together." What anthropologists can say without doubt is that early modern humans who were venturing into Europe during the last Ice Age were expressing themselves artistically. Just think of the cave paintings from around this time, says Ian Tattersall at the American Museum of Natural History in New York. "We know that these early humans had the kind of creativity that we have, and now we know for sure that this creativity from the earliest time includes music," Tattersall says. Music and art reveal that human beings are using abstractions and symbols: the hallmarks of humanity. "It gives us imagination. It gives us the possibility to create new worlds," Tattersall says. And that is just what our ancestors needed as they pushed north — despite the hostile Ice Age conditions 40,000 years ago.